Tryptophan is an essential amino acid known for its calming and sedative effect for the nervous system. It also helps to produce niacin or vitamin B3. To produce this vitamin, the body must have adequate levels of iron, pyridoxine (vitamin B6) and riboflavin (vitamin B2). 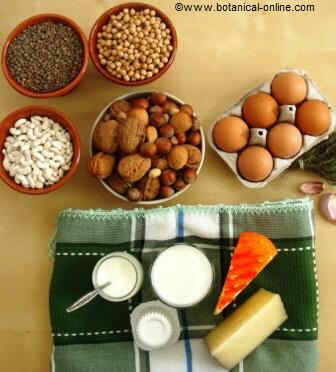 Dairy products, eggs, legumes and nuts are ovolactovegetarian sources of tryptophan. Tryptophan is essential for babies to grow properly and for nitrogen balance in adults. There is L-5-hydroxytryptophan which is a derivative of the amino acid tryptophan which also becomes a precursor of the neurotransmitter serotonin. Triptophan is often used as a sleep aid in cases of insomnia or difficulty sleeping either caused by increased stress or nervousness. Tryptophan is a good assistance to relax because it helps the brain produce serotonin, the “happy hormone”. At the same time, serotonin is transformed into melatonin, a hormone that regulates sleep-wake cycle, allowing to solve sleep disorders. Eating foods rich in tryptophan can help reduce anxiety or even depression, as it has serotonin with antidepressants and anxiolytic effects. Stress, anxiety or other nervous system abnormalities can also lead to other physical anomalies that are reflected in the body, such as back pain, stomach pain, etc. It has been found that is very helpful in migraine, since patients enrolled in this disease often have neck stiffness and a high level of stress, and this amino acid exerts a relaxing action. It is also proven its calming effect in cases of hyperactivity, and it even affects food intake, since it reduces the appetite and desire to eat, being very useful in case of eating disorders such as bulimia. The lack of tryptophan is mainly perceptible in the form of oral pain and redness of the mucous membranes of the mouth. Young children and people who follow a strict vegetarian diet are those who often have major deficiencies of tryptophan. Ovo-lacto-vegetarian people, that is to say, people who drink milk, eggs or dairy products, are not usually deficient in this amino acid. Stress is also responsible for the decreased levels of tryptophan. – Pregnant women or people suffering from liver and kidney should not take supplements of triptophan. – People who are taking medications for depression or tranquilizers should not take tryptophan supplements without medical consent. Animal foods are those that contain more tryptophan, mainly eggs and milk and, to a lesser extent, meat and fish. Within plant foods, we include, for example, whole grains. Although you can take supplements of triptophan, it is recommended to cover the needs of this amino acid through a balanced diet. If supplementation, it is appropriate to consultation a specialist before taking it..